I used to think that booking hotel rooms cheaply was about finding the hotel booking website that displayed the cheapest prices — it’s not. I was wrong. And I’m not talking about quality either. I’m talking about price and value. In reality, finding the cheapest hotel booking website is only the first step. The magic lies in what comes after that. Why is it not important which hotel search website I use? Well, it’s not exactly “not important”. But there are other ways to get better deals. You see, unlike airfares, hotel prices are more negotiable. Many companies, including the hotels themselves, offer lowest-price guarantees. And when you take advantage of this guarantee, you can often get other perks on top of the low price — examples: price drop protection, free nights, loyalty points, etc. But there are also deals that no self-respecting companies will match because the prices are so low — you should book them if they’re better than anything you can get by price matching. These are secret hotel deals, flash sales and hotel auctions. I’ll go through them in a minute. 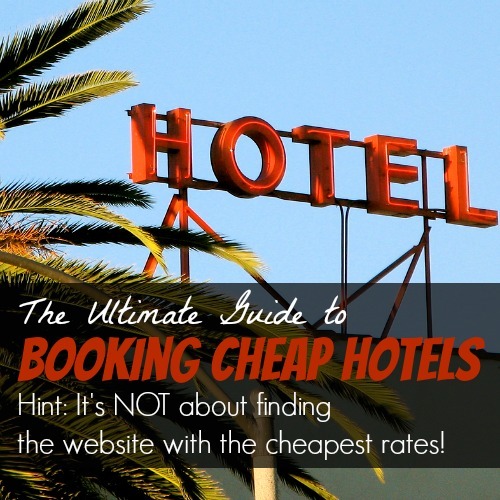 So how do I really book cheap hotels? Start by searching booking sites, then choose one of six booking options I outline below. Each option has its own set of pros and cons, so choose based on what you value in a hotel stay. Tip: Don’t forget to clear your cookies or turn on “incognito” browsing before you search. If you’ve done the same search before, booking sites might have your history and show you higher prices. Click here to see how I used these tricks in a real hotel search. 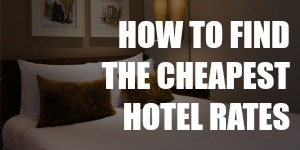 The very first thing you need to do is gauge how much hotels generally cost. I used to check multiple sites for prices, but now I just stick with HotelsCombined. This website searches hundreds of hotel booking sites at once, so it saves a bunch of time. Also, HotelsCombined shows all-inclusive prices, so you don’t have to wade through the search results one by one to figure out how much fees and taxes will be. Tip: If you don’t feel like spending too much time on hotel booking, you can quickly book a room through HotelsCombined. The prices on this site are reasonably cheap. Yes, you may pay less if you do more research, but the savings (if any) may not be worth the effort. Check out this post to see a real-life example of how the prices on HotelsCombined compare to those on other booking sites. Hotel rates change all the time. If you’ve booked a room and the rate drops, you’d be missing out on the lower rate. With price-drop protection, you’ll be able to take advantage of price drops even after you’ve confirmed your booking. It’s super easy. It’s just like making a regular booking. Book any time. No need to monitor prices in case they change. You won’t earn hotel loyalty points. Tingo is the website that offers automatic price drop refunds. So if the rate of your hotel room drops after you’ve made a booking, Tingo will automatically refund the difference to your credit card — you won’t even need to call them or anything! There’s no limit on the amount of refunds or the number of times Tingo issues them. You’ve probably seen secret hotel deals before if you’ve booked a trip through Hotwire, Priceline, Travelocity or lastminute.com. They appear in the regular search results, except the hotel names are missing from the listings. You’re only given certain details of each hotel — usually its neighborhood, star rating and amenities — but it’s possible to guess which hotel it is from this information. They’re quick and easy to book! These being special deals, there are few choices available. You can only get these deals at the last minute. You won’t be able to accumulate hotel loyalty points. Flash sales last for as short as a two hours, so you have to watch the sale schedules and pounce on these deals as soon as you can. Flash sale sites typically sell rooms at higher-end hotels and resorts, which can be a good thing or a bad thing, depending on your travel style. You may have to become a member to access these deals, but membership is usually free. These deals may not be the cheapest you can get for those particular hotels. Before you confirm your booking, check HotelsCombined and the hotel’s website. The reservation is usually non-refundable. Priceline holds the rights to opaque bidding, so you can only use this method there. Here’s how it works: you choose your preferred area and star rating, then set the lowest nightly rate you’re willing to pay. If Priceline finds a matching property, then you’d win the auction and the room is immediately booked for you. If there’s no match, you’d have to wait 24 hours before you can place another bid for hotels of the same star rating in the same neighborhood. There are tricks you can use to submit multiple bids per day — I’ll write about them in a future post. Aside from the star rating and the neighborhood, you won’t get many choices. After you bid, you can’t change your mind even if you don’t like the hotel. If the price is right, Priceline books the room for you. After you’ve made the payment, you can contact the hotel to make your requests (eg. bedding configuration, smoking or non-smoking floor, etc. ), but there’s no guarantee that you’ll get what you want. You won’t get hotel loyalty points. It’s not ideal for group bookings. If you get one room at one hotel, there’s no guarantee that you can get a second room at the same hotel at the same price. It’s also not so great for long trips. The longer your stay is, the harder it is to find a room on a Priceline auction. To try your hand at hotel room auctions, visit Priceline. Some booking sites offer a lowest-price guarantee and will match the prices you see elsewhere, subject to certain conditions. You can take advantage of both the lowest price you can find AND exclusive offers from your favorite booking website. There’s a wide variety of hotels and hostels you can price match. You’ll have to submit a request for the website to match the lowest price you found. This could be a tedious process. The best value-for-money booking website for price matching is Hotels.com. This website has its own loyalty program: for every 10 nights that you book, you get one free night. This promotion applies to 100,000 hotels all over the world. 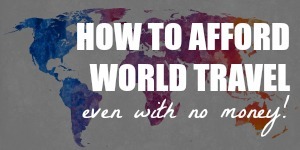 So you could earn your points in Australia and Asia, for example, and claim your free night in Africa. It’s like a 10% discount on top of the already cheap nightly rates! When it comes to the hotels’ own price-matching offers, many hotels will not only match the lowest price you can find — they’ll give you a discount off that rate! For example, Marriott has a best-price guarantee. If there’s a website that sells a Marriott room at a lower rate than Marriott’s website, they will give you a 25% discount off that rate. So if the Marriott website has a room at $250 and the same room is available on Travelocity for $200, you’d be able to book with Marriott, then file a price matching claim. If approved, Marriott will offer you the room at 25% off the Travelocity price, so you’ll get the room for $150. You may get better rooms because hotels often keep the best ones for guests who make direct bookings. Some hotels are willing to offer freebies, such as breakfast or parking for direct bookings. By booking directly with the hotel, you can also accumulate points in the hotel’s loyalty program. Of course you hope everything will go smoothly during the trip, but sometimes things happen and you need to change your reservation or make a complaint. Resolving these issues would be a lot less painful if you booked your stay directly with the hotel. You’ll have to submit a request for price matching; the process is not as simple as a straightforward hotel booking. I know Marriott is good at honoring the claims quickly, but I’m not as familiar with how other hotels handle the process. Not all hotels offer a best-price guarantee, so your choices will be limited. Accor 10% off Adagio; Formule 1; Grand Mercure; Ibis; Ibis Styles; Ibis Budget; hotelF1; Mercure; MGallery; Novotel; Orbis; Pullman; Sofitel; Suite Novotel; Thalassa Sea & Spa; The Sebel. Best Western $100 voucher Best Western; Best Western Plus; Best Western Premier. Choice Hotels 1 free night Ascend Hotel Collection; Cambria Suites; Clarion; Comfort Inn; Comfort Suites; Econo Lodge; MainStay Suite; Quality; Rodeway Inn; Sleep Inn; Suburban Extented Stay Hotels. Hilton $50 off Conrad Hotels & Resorts; DoubleTree by Hilton; Embassy Suites Hotels; Hampton by Hilton; Hilton Garden Inn; Hilton Grand Vacations; Hilton Hotels & Resorts; Home2 Suites by Hilton; Homewood Suites by Hilton; Waldorf Astoria Hotels & Resorts. Hyatt 20% off Grand Hyatt; Hyatt; Hyatt Hilara; Hyatt House; Hyatt Place; Hyatt Regency; Hyatt Residence Club; Hyatt Ziva and Andaz; Park Hyatt. Intercontinental Hotels Group 1 free night Candlewood Suites; Crowne Plaza Hotels and Resorts; EVEN Hotels; HuaLuxe Hotels and Resorts; Holiday Inn; Holiday Inn Club Vacations; Holiday Inn Express; Holiday Inn Resorts; Hotel Indigo; InterContinental Hotels and Resorts; Staybridge Suites. Marriott 25% off Autograph Collection Hotels; Courtyard Marriott; Fairfield Inn and Suites; Gaylord Hotels; JW Marriott; Marriott Conference Centers; Marriott Executive Apartments; Marriott Hotels and Resorts; Marriott Vacation Club; Renaissance Hotels; Residence Inn; Springhill Suites; Towne Place Suites. No price matching for: Bvlgari; Edition; The Ritz-Carlton. Preferred Hotel Group Price match only Preferred Boutique; Preferred Hotels and Resorts; Preferred Residences; Sterling Design; Sterling Hotels; Summit Hotels and Resorts; Summit Serviced Residences. Starwood Hotels and Resorts 10% off or 2,000 Starpoints Aloft; Element; Four Points; Le Meridien; Sheraton; St Regis; The Luxury Collection; Westin; W Hotels. Wyndham 10% off Baymont Inn & Suites; Days Inn; Dream Hotels; Hawthorn Suites by Wyndham; Howard Johnson; Knights Inn; Microtel Inn & Suites by Wyndham; Night Hotels; Planet Hollywood; Ramada; Super 8; Travelodge; TRYP by Wyndham; Wingate by Wyndham; Wyndham Garden; Wyndham Hotels and Resorts; Wyndham Grand Collection. Confused? Need to see how it all works in real life? Follow me as I use these tools and techniques to compare hotel rates for a real trip. You have some great tips for finding cheap hotel. We love to travel, but it would be nice to save some extra money on lodging costs. Next time we plan a trip, we’ll take your advice and look at booking sights. These are some great tips for booking hotels! I really like the sixth option of asking for the hotel’s lowest price guarantee. I would love to get better rooms than what I was planning! I didn’t know hotel prices were negotiable. I guess that’s because hotels lose money when there are empty rooms. I’ll have to try to deal harder the next time I vacation. Yes, do it! Hope you manage to get a good deal on your next hotel room! I like that there is a lot of different websites to be able to find good deals on hotels. When going on vacation one of the first things you have to do is to book a hotel. Because staying in a hotel is a major part of the expenses of a trip it is important to make sure that you get a good deal. Like you said, comparing all of these different resources will help you to be able to get the best deal. Thanks for the hotel booking tips. I love going on vacation, but it can be hard to find the right accommodations, for sure. I agree that it’s not always best to go with the cheapest option. I would rather negotiate for a higher priced room. I like your idea of using websites like hotelscombined to find good hotel prices. I would imagine that websites that compare prices could help you find the best deals for you. I’m going on a road trip soon so I’ll have to compare room prices to find the best one for me. 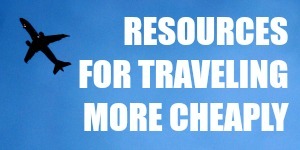 You have some great tips here for saving on hotel booking. I had no idea that hotels even offered flash sales, that is good to know. Although the booking window is short, if I could book in that time, I bet it would be a cheaper! I thought that your tip to book a room with a hotel filing a price matching claim was really helpful. There have been a few times when I wanted to stay in a room that was a bit pricey, so it helps that I can look at their best-price guarantee, look at the price for the same room on a booking website, then try to get a price matching claim approved to get a discount. That will allow me to stay in the hotels I want at a price that I can afford. I would have never thought to negotiate hotel prices. Something tells me I am a bit late in the game. My hubby and I are planning a baby-moon on a budget and have been searching high and low for good lodging prices! I will have to let him do the gambling since he has a silver tongue. If you have a particular hotel in mind, calling the hotel directly can often result in better rates. Since you’re able to speak with someone inreal time, the staff will often be privy to rates that aren’t advertised online. Otherwise the popularity of hotel metasearch engines is on the rise and for good reason: it’s one of the most efficient ways to find affordable accommodations. If you’re unfamiliar with this concept, a hotel metasearch engine is a website that searches multiple hotel booking sites at once. Have a nice travel..
You have some excellent suggestions here for how to find a good hotel. My family is going on a small trip soon, and we would like to have a good hotel. It would be great to get a good price, but I also want to be sure that it is a nice hotel. I personally like your second booking option, which is to get price matching done. When I start looking for a good hotel, I will ask if they do this to see if I can get a better rate. Thanks for the great post! Thanks and all the best with the hotel booking! Thanks for sharing all of these great tips! It is awesome to see that there are so many great deals around. I’m in the middle of planning my honeymoon, so this will be perfect for me. Hopefully I can find a hotel that will have a room for less than $100 per night. These are some great strategies and a few new-to-us websites we’re going to have to try out. I too am an over-researcher when it comes to booking and can vouch for many of these strategies. Right now I type this from Oviedo, Spain at a 4-star hotel listed for $48 on hotels.com, which I actually got that for free thanks to their reward program! I’ve had some great luck lately with hotels.com. Priceline and Hotwire have been good for us too. I’d also add that there are some decent sites out there which are good at uncovering what the secret hotels actually are. However, they’re typically just for the US. Everyone seems to be raving about TravelPony lately but its never yielded much for me. Perhaps its just the locations I’ve been. I’ve also liked hotel tonight which has been great for last minute stays in major cities. Anyhow, thanks for the guide. I look forward to trying out a few new sites and tricks you’ve suggested! That loyalty program is a pretty good deal, huh? :D And you’re right, there are some forums where people discuss what the secret hotels are, but I find it quicker and easier to find out for myself. Thanks for the tip about Hotel Tonight; you’re the second person to recommend it, so I’ll definitely give it a try someday. If you have high standards and high tolerance for uncertainty, I’d try out Hotel Tonight app. It releases hotel prices for hotels for that night at noon every day, and the prices are usually pretty good deals, especially for upscale places.